It's a very simple ingredients. 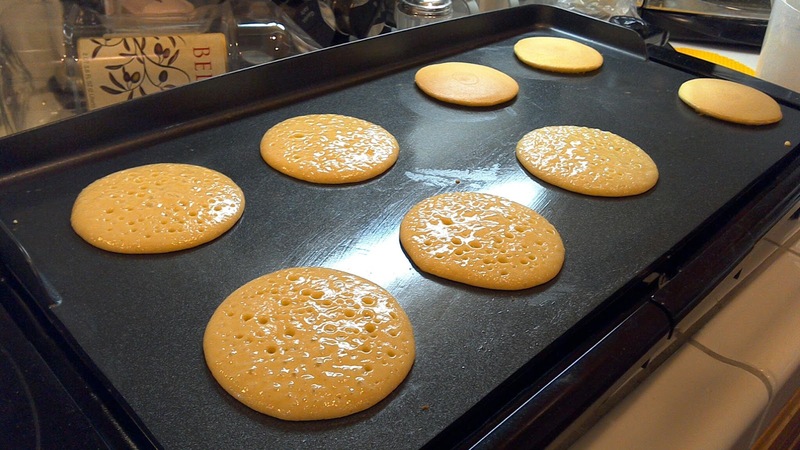 Let's bake stuff filled with lots of good nutrients rather than plain sugar and flour, etc. Let's make it to you feel like you are adding nutricious value to every byte. 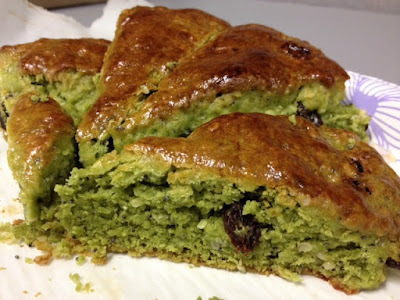 So, this is my second testing with the morning scones with Organic Kale powder, Organic Hemp Seeds, Organic Raisins, Poppy seeds. The ingredients are very simple. You will need a food scale. Egg Wash: 1 Large Organic Egg Yolk with 1 to 2 Tbsp of Heavy Cream. Prepare baking sheet lined with parchment paper. Set aside. In a medium size mixing bowl, add flour mixture, then, add 3/4 of 6 oz heavy cream to the center. Do not add all the heavy cream in all at one time. Use your eyes and touch to determine if there is enough heavy cream. It all depends on how dry your flour is in your pantry. 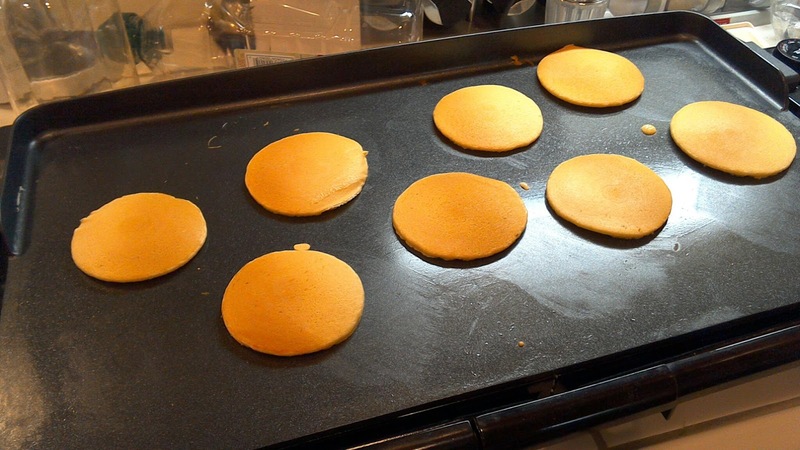 "Fold" in with spatula a bit to let the cream moisten the flour…. and wait for about 10 seconds. Check the bottom of the bowl. There will be more dry flour left, so add the heavy cream to the bottom and add the Goodies, then use spatula to cut it in. Do not stir crazy. You are only moistening the dry flour together. The dough should be soft like cookie dough. Transfer to floured work surface to keep the dough from sticking to the work surface. Knead firmly ONLY 9 times, then on 10th time, form into a Disc by the palm of your hand - about 8 inches round. -- Do not push down crazy, just be gentle when you push down to form into disc. Transfer the dough onto baking sheet lined with parchment paper. Preheat oven to 425'F. Rack on center of the oven. Beat 1 egg yolk with 1 Tbsp of Heavy Cream to make Egg Wash - See if there is enough egg wash after beating it with fork to cover top of the scone Twice. If not, add a bit more heavy cream and or extra egg yolk (depending on the size of your original egg yolk). -- Egg wash gives that crispy shine on the top. 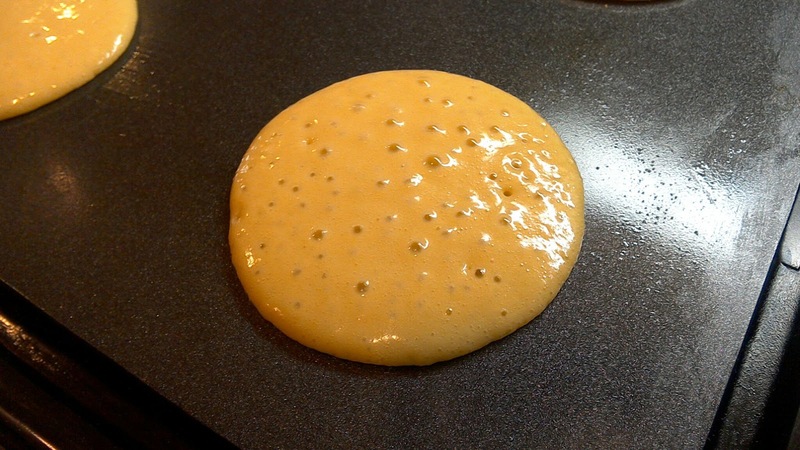 Apply Egg wash to the top of the dough. Use Pizza cutter to cut through the disk into triangle shape. -- If you are using a sharp serrated knife, Hold the knife Vertically to Slice through. This is bit difficult since the dough is kind of sticky. So, the best thing to use is the Pizza cutter. But if you don't have one, just DO NOT PRESS down to Cut the dough because it will 'seal' the sides of the scone dough to keep from rising properly. Let the first coat of egg wash to dry a bit - 5 min. Then, apply egg wash again. Bake approximately for 15 min, depending on the BTU of your oven/convection oven. It's ready when the top is browned and dough is dry. 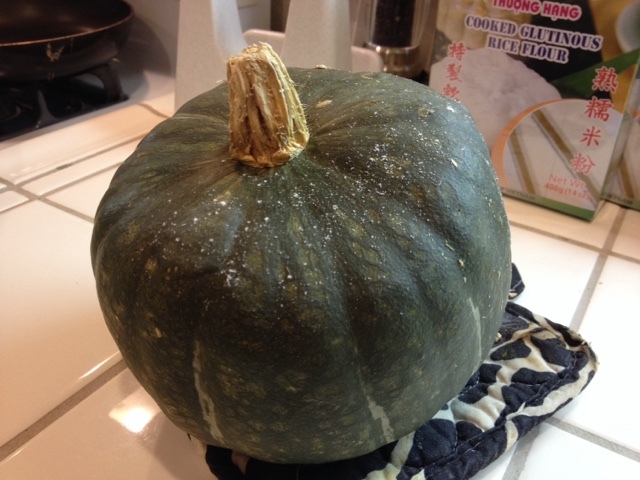 Another tasty sweet natural home grown KABOCHA. Just rinse it, cut open, de-seed, put in a roaster pan with lid with some water. It comes out tender and sweet. 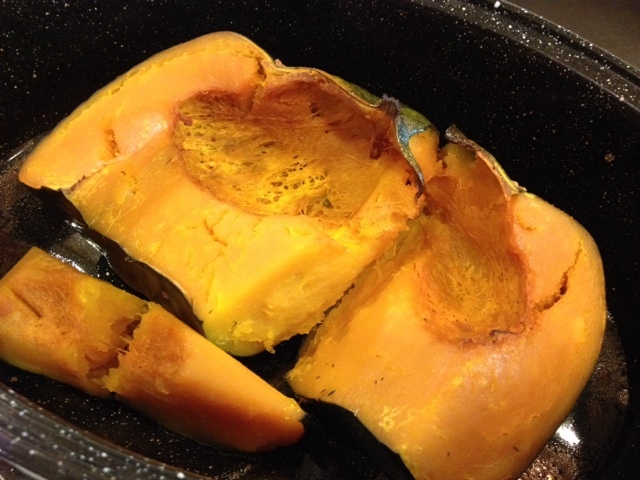 I love KABOCHA. Do you? If you have purchased from a grocery store before, I myself had a bad experience with it. I don't know how old it was, but my taste buds were stunned by its musty bambooshoot odor and taste. It was unpleasant. It was a "blah" taste. Now the KABOCHA has been cropped in my brothers garden I do not refuse the offer to take home one or two. Try it. You will love it - roasting it is the best method. Put it in your Chiffon cake or pie instead of that mushy watery pumpkin. You will have fans. 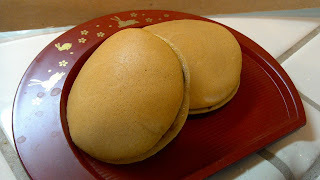 Finally this recipe found at www.Japanesecooking101.com turned out a successful Japanese pastry called DORAYAKI. 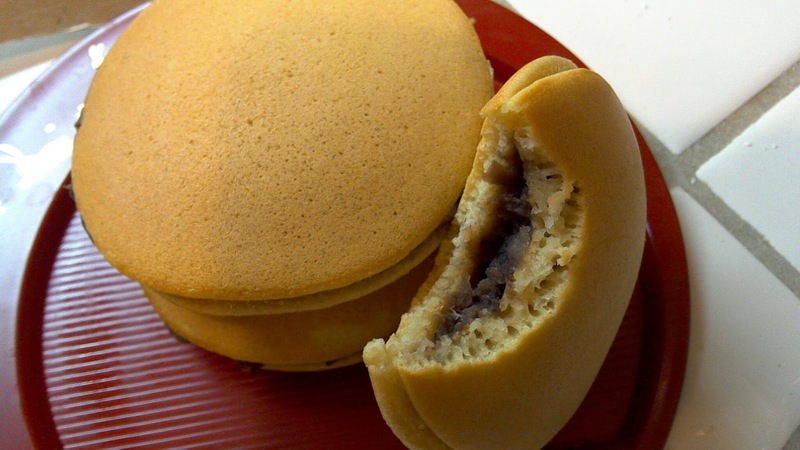 It's fluffy, and I like the idea of fresh DORAYAKI that I can control the sweetness of. 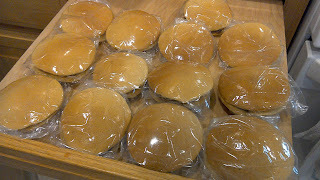 The commercially made pastry is all right, but I think they are overly sweetened to prolong the shelf life. I wasn't too much of its fan before, but after this batch, I am eager to make them whenever, such as for bake sales.